When you own a home or business, there might come a day when you start to suffer from drainage issues. Whether it is a slow drain, a recurring clog, or a main drain backup, no drainage system is faultless and most need to be occasionally serviced to ensure proper operation. Having a drain line that is not functioning as it should be is a hassle – it causes stress and can even cause property damage if left untreated. Budget Rooter is proud to service the New Castle County and surrounding areas, using the best green technology available. Today, our team at Budget Rooter will talk about sewer jetting and why it can be the best method to return your pipes to their best operating efficiency. Sewer jetters are also known as hydro-jetters or water jetters. Designed to clean drains, they are machines that utilize carefully directed, high-pressure water jets to clean blockages in both commercial and residential drain pipes. 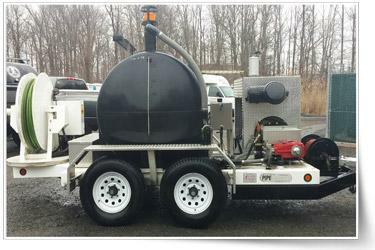 A sewer jetter is composed of a pump, motor or engine, hose reel, and specialized nozzles. The high-pressure pump delivers an extremely powerful flow of water that powers through the most difficult of blockages, and flushes out the resulting debris. The reel allows the technician to extend and retract the heavy hose with ease, as he directs and controls the water pressure and flow of the water with the nozzle. The sewer jetter can reach pressures of up to 4,000 pounds per square inch, and thoroughly cleans pipes from wall-to-wall. Here at Budget Rooter, our jetting technicians receive two years of training on this equipment, thus ensuring that they have the expertise necessary to easily and effectively clean even the most stubborn blockage. Why Do We Use Sewer Jetting? Sewer jetting is used most often when a traditional drain cleaning machine is unable to be effective, or if they are unable to be used. For example, in cases where there is heavy grease, sludge or soap scum build-up, a drain cleaning machine simply cannot remove the sticky residue that clings to the walls of the pipe. Although the drain may be opened with the drain cleaning machine, the remainder of the deposits will remain and may cause another blockage or even foul odors a few months down the line. The sewer jetter is able to clean those same pipes thoroughly and will blast away the residue that clings to the walls of the pipe by harnessing the power of water, keeping strong and often harmful chemicals out of your drains, and out of our environment. Going green for the environment doesn’t mean you have to settle for a half-working system! Other examples of cases where a sewer jetter is best used are: if your sewer line is longer than 150’, if it is full of debris, or if the pipe has a significant “belly.” Restaurants and other commercial businesses can especially benefit from sewer jetting, and many opt for periodic maintenance to avoid costly down time and potential loss of business due to a bad back up. Our sewer jetting system is appropriate for both commercial and residential systems, as both an emergency solution or to provide maintenance. If you have a problematic drain or sewer line, don’t wait! Call Budget Rooter today and schedule a free estimate or consultation. As a family owned and operated business, we closely work with local families and businesses to provide the best possible solution, with our skilled crew giving you the diagnosis that you need instead of selling you extra services that are unnecessary. Budget Rooter has been providing stellar service throughout the New Castle County and surrounding areas since 1992, and is known for reliable, professional, and effective drain and sewer cleaning services in our area. Give us a call at (302)421-9000, and our friendly office staff will be happy to assist you! Previous post Top Signs You Are About to Experience Drainage Issues Next post What Exactly is a Video Pipe Inspection and How Does It Work?